Anyway, it seems like “clicker” and incremental type games are all the rage these days. The idea is that you rapidly tap on the screen of your device to increase the amount of currency or points or whatever you’re supposed to be getting to unlock a myriad of things that’ll up the rate of growth of the currency or points which continually accumulates automatically. Eventually, it’ll get to a point where the game will play itself and manual intervention is only required to purchase more unlockables. I’m going to highlight a few that I enjoyed or still enjoy. 😀 All of them are 100% free (with ads) and in Japanese! They’re very easy to play though! In terms of gameplay, it’s reminiscent to Tap Titans where you quickly tap the screen when an enemy appears … which is pretty much all the time. However, your hero does move from enemy to enemy and will automatically attack foes by himself when he comes across them. The player’s role is almost like an additional ally as your taps count as attacks as well. 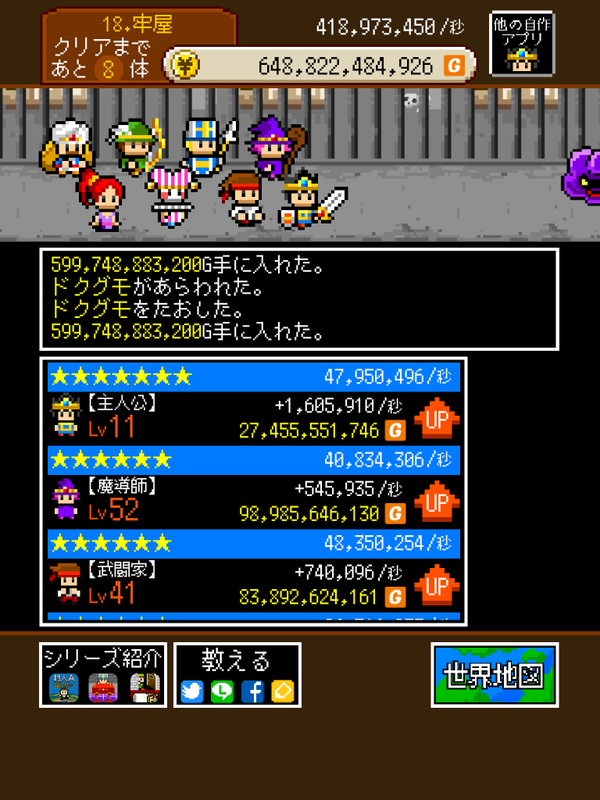 As you gain money, you can unlock more party members as well as upgrade the amount of damage (that’s calculated as gold ^^) you dish out. 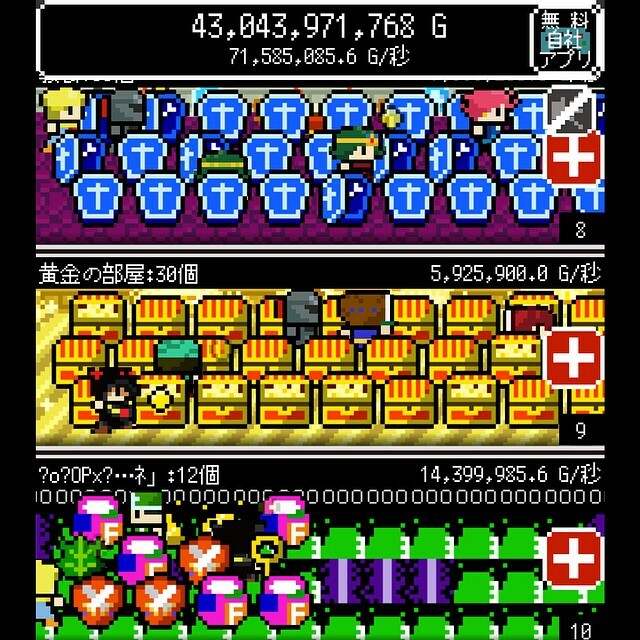 There’s at boss at the end of each area and it typically takes a while to defeat. I recorded the cute attack animations of the full party during one of those battles. Check it out. ^o^ (The link leads to my Instagram account with the video clip.) Although they don’t impact the game mechanics at all, I should mention that there are snippets of dialogue and story between areas too. The game starts with you breaking a giant vase in an old man’s home but not long after, this evil god employs your vase-busting skills. The title roughly translates as ‘Villager: “Please break the vase(s)!” Hero: “Huh?” Leave ・ Develop’. (That’s “leave” as in the game will continue on its own even if you close the app.) As mentioned above, the developer thinks up goofy stories for their games. This one starts off with the hero waltzing into an old man’s home and spotting rows of vases and jars. He thinks to himself that he’ll go and bust them all (because, you know, that’s what RPG heroes do) while the homeowner has his back turned. However, the elderly man turns around, welcomes the stranger, and says, “Please break these vases.” Of course, the hero’s surprised and confused so the man has to clarify the request twice, each time with increasing emphasis. ^o^; And that’s how the game begins. The gameplay of this title is no different than Spare Time RPG; there’s tapping and unlocking. In this case, instead of unlocking new characters, you’re opening up new locations and more and more heroes (or just random NPCs) automatically join in on destroying various items that magically manifest around them as you upgrade. Not entirely sure what’s going on with floor 10. 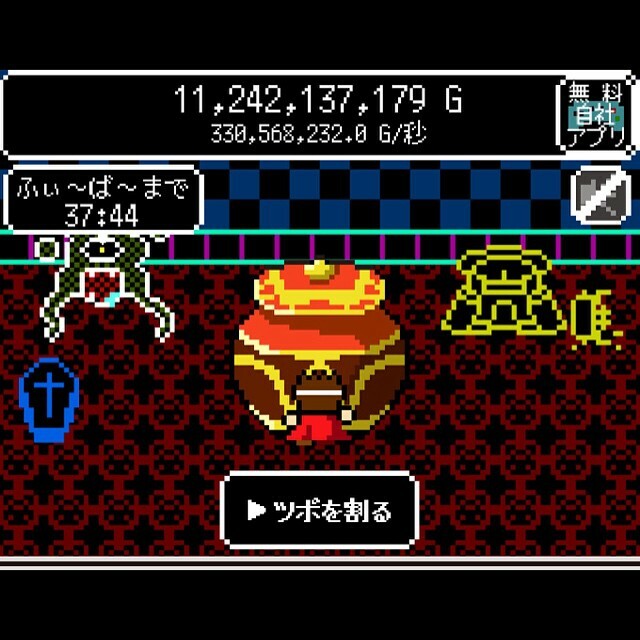 Oh, there’s a bonus that occurs every 40 minutes called Fever where the hero is joined by fellow adventurers to break as many vases as possible within 30 seconds for additional gold that’ll be added to your overall total. For the duration of this, you slide your finger up and down to guide the band of little pixel people dashing across the screen populated by their targets. The goal is to seek out vases that give the most amount of money. Ah, there’s something I almost forgot to mention: another reason I like GLOBAL GEAR, K.K. is that all their games are absolutely free. There are non-intrusive advertisements though! This one is no exception. Breed mice but look out for these mutant cats! 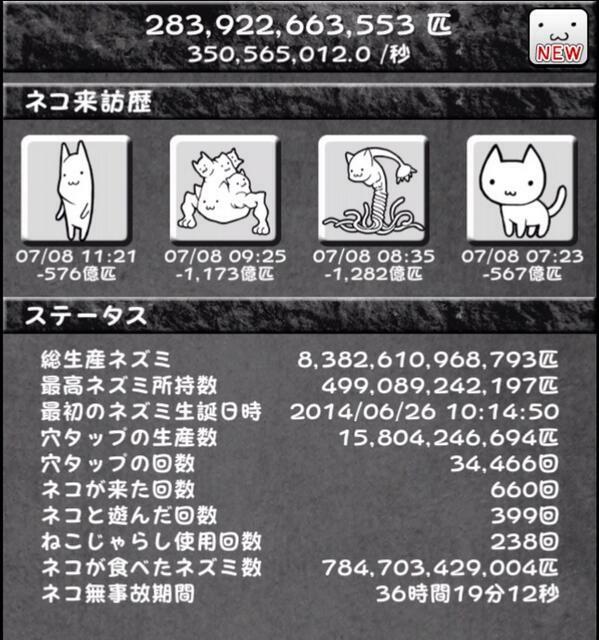 You can see some of the mutant cats feeding here: https://instagram.com/explore/tags/ネズだく/ Google Images actually picks up more types though so if you’re curious, give either the full game title or the shortened ネズだく a search. Incidentally, there is a game dedicated to the mutant cats where you get to help them kill and devour mice in gruesome ways. ^^ Once a cat feeds on a certain amount, it’ll evolve in an equally disturbing way. Usually, the metamorphosis involves the current form exploding or falling apart in some manner with blood splurting out everywhere. I have no idea why this developer is so sadistic. At any rate, this other title is called Nyanko Hazard. It’s available in many regions on iTunes/App Store. The title you’re looking for is にゃんこハザード 〜とあるネコの観察日記〜. Or you can just look for swagApp inc. Unforunately, it looks like it’s region locked to Japan on the Play Store.